Step 1 Heat a large skillet or saute pan over medium heat and place the beef fat in the pan, moving it around with chopsticks or spatula as it melts so that the entire surface is greased. When the fat is hot (it may not be entirely melted; it will melt as the dish cooks), add the sugar and cook until it begins to caramelize. Add the soy sauce and sake (be careful as it will sputter). Step 2 In arranged mounds, add the onion, cabbage, tofu, mushrooms, green onions and itokonnyaku; they should be placed in neat bunches, leaving some room for the beef. Step 3Bring the contents of the pan to a boil over high heat, then reduce the heat to a simmer. Place the beef in a mound in the pan, alongside the other ingredients. Cook just until the vegetables are tender and the meat is cooked to the desired consistency, about 8 minutes, pressing the ingredients into the broth so that they cook evenly. Add the shungiku leaves in the center on top of the other ingredients and simmer just until the leaves wilt, about a minute. Remove from heat and serve immediately. In Recipes-list.com we have selected the most viewed recipes from category - Main courses Soups . Enjoy the best recipes specially selected for you! 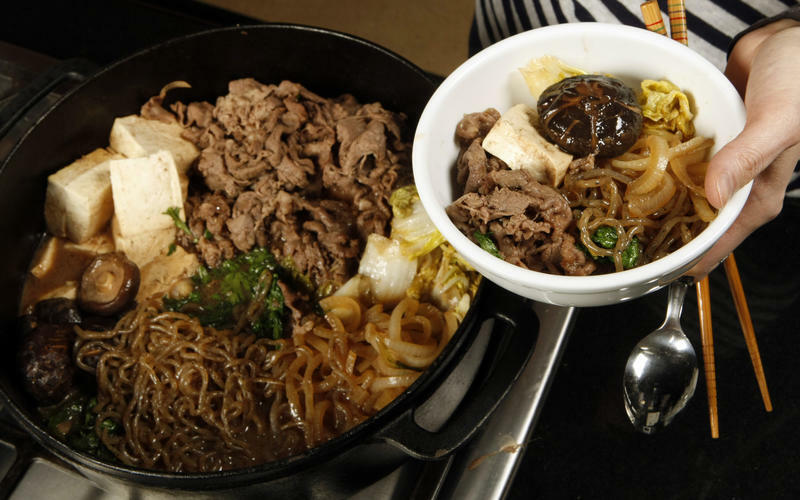 Tokyo-style beef sukiyaki is the right choice that will satisfy all your claims.